This is a guest blog post by Nathan Hill, Optimization Evangelist at NextAfter. The more year-end fundraising emails you send, the more money you’re going to bring in. But it can be hard to justify to your donors (or potential donors) that your email is worth sending. And if you send too many emails that don’t get opened, you’ll get marked as spam and burn out your list. If you’ve spent any time at all running email fundraising or marketing, you understand this balance well. It takes a little bit of science and a little bit of art to maintain a healthy email file. 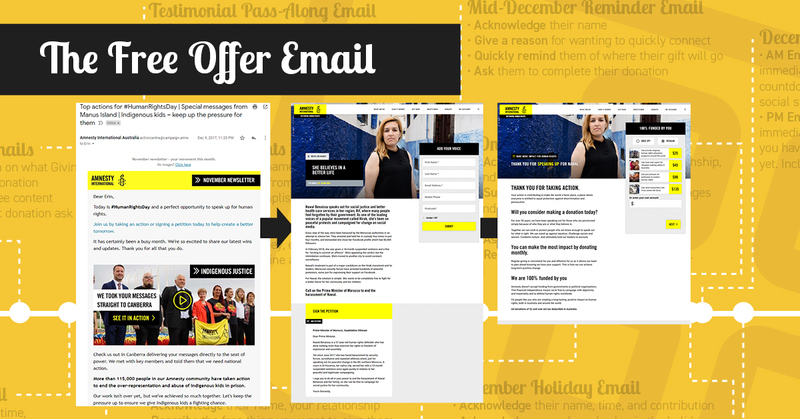 But particularly during year-end, email becomes a critical tool to drive donors to your site, remind them of the deadline to give, and help them understand exactly how valuable their donation is. 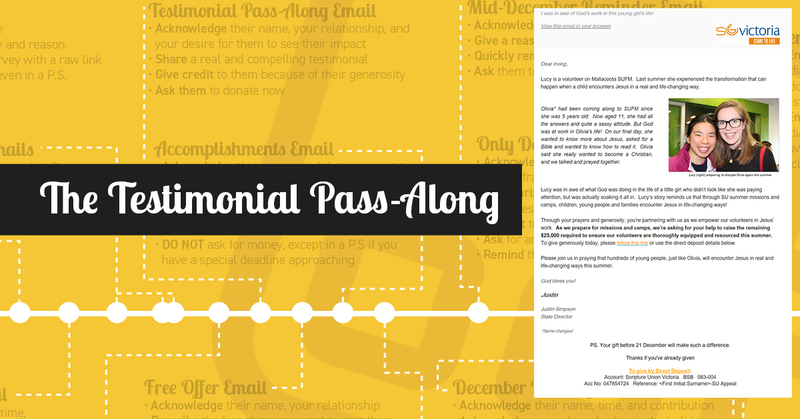 So, how do you send more year-end fundraising emails without burning out your list? You’re not going to mark emails from a family member or friend as spam simply because they’ve emailed you a few times this week. But you might mark an email as spam if it’s sent from some online retailer that has already sent you 3 other emails this week about the same 20% off sale. Why is one acceptable, and the other spam? If we want our emails to be seen, opened, read, and donated to, they need to be fostering a relationship rather than being the inbox equivalent of a billboard. So, how do you create emails that foster a relationship and maintain relevance when your end goal is to acquire more donations at year-end? Well…that’s what the rest of this post is for. 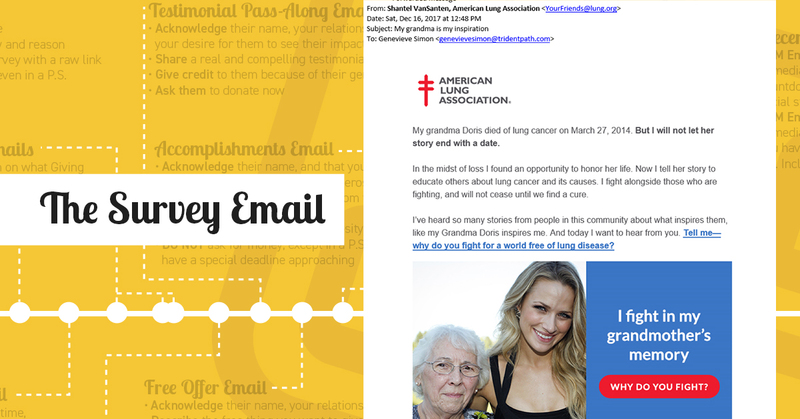 I want to give you 5 unique year-end fundraising email ideas that you can use to communicate with your donors more often, and in a relevant way. Read on to learn exactly what they are, and how you can do them yourself. That’s the right question to ask. Or at least, not right away. There are some types of emails that you can expect big donation responses from immediately, like an email that makes a hard and direct ask for a donation. These are the kind you most often send towards the very end of December. But other emails are designed simply to cultivate a relationship, and prime your donors for a future direct donation ask. And that’s exactly the purpose of this survey email. Send Date: Early in the year-end season — before Thanksgiving, if possible. Email Contents: Personal email asking the recipient to participate in a survey that will help you understand where to best focus your efforts. Call-to-Action: Send them to a brief survey where they can weigh in on important issues to help prioritize your efforts in the new year. Should You Ask for a Donation? No. Not even in a P.S. This type of email does 4 key things. First, it’s disarming. Your subscribers may be expecting a donation ask (especially if you don’t send a lot of cultivation already). This breaks down barriers and lowers the defenses of potential donors. Second, it makes your donors feel important. These people aren’t just on the receiving end of some marketing machine anymore. You’re giving them a voice and opinion in your work. Third, it’s engaging. Participants are actively participating in something related to your cause. And they get to tell you what matters most to them right now. Finally, it creates a sense of agreement. By limiting the responses that donors can give (3 max) and focusing them on specific aspects of your value proposition, your donors will naturally be in agreement with the content of future emails you send this year-end. This email is really straightforward. And you may already have it in your plans. But how nice is it to simply say thanks to all the subscribers and donors on your file? That’s the sole purpose of this email — to express gratitude unattached to an additional donation ask. Email Contents: A simple, personal thank you to your donors and subscribers. Call-to-Action: Give them some type of free content. It could be as simple as a blog post about their impact, or as complex as video from someone involved in your organization’s impact. This type of email also isn’t about asking for donations. Instead, it’s about something even more valuable: giving back. If your donors feel valued, you’re building a better relationship with them than you would if every email was just an ask — and they’re more likely to pay attention to your next email. Giving Tuesday is hugely important. It’s not the biggest giving day of the year (Dec. 31st still holds that crown), but it’s now an essential giving day for nearly every organization. And while it sounds simple enough to send a direct donation ask on Giving Tuesday, I’d like to propose a little more in-depth strategy. 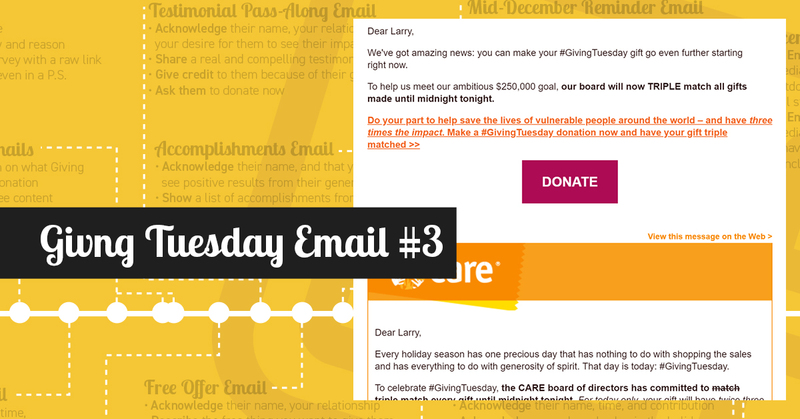 Email 1 – Send an email out the day before, educating your donors and subscribers about what Giving Tuesday is. You can ask them directly to participate early and donate now. 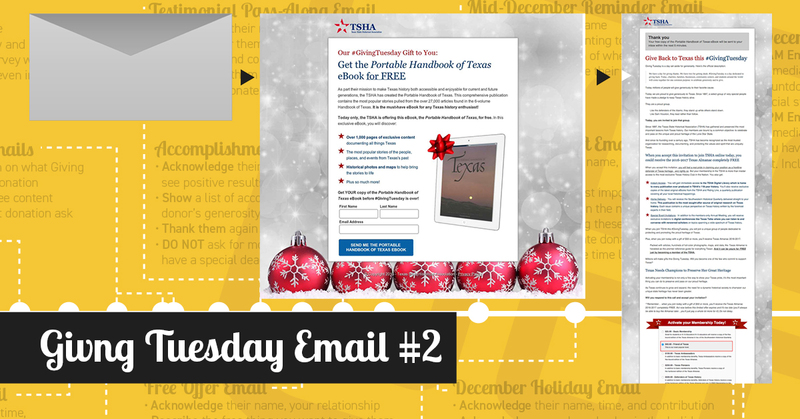 Email 2 – Send an email on the morning of Giving Tuesday, but don’t ask for money. Give them something for free (e-book, course, quiz) that they have to complete a form in order to receive. Place an instant donation page after they hit the submit button. Email 3 – Make a direct donation ask that afternoon, emphasizing the deadline. This type of series does a few things. 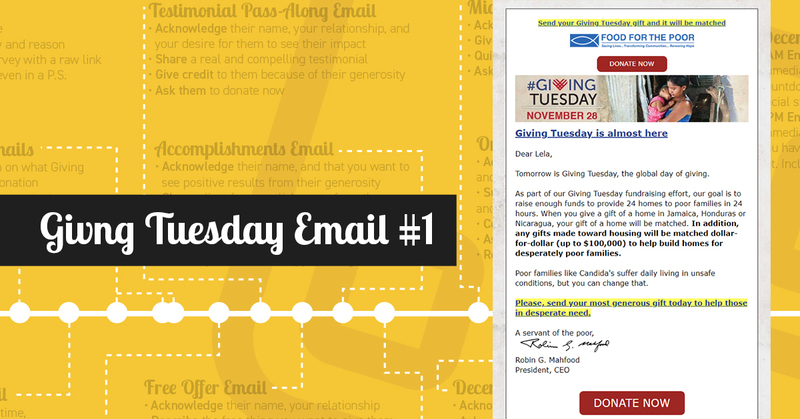 Email 1 helps donors who might not have heard of Giving Tuesday get acquainted with the idea. And even for those who know what it is, it primes them for your Giving Tuesday ask the next day. Email 2 serves as a reminder that it’s Giving Tuesday, but also shows that you’re focused on more than just capitalizing on an international giving day. You’re practicing generosity in giving away something of value. The instant donation page presents an opportunity for donors to give back after having just received something from you. Email 3 rounds off the email series with a direct donation ask for those that have not yet given. This type of testimonial email tries to get away from the typical “Hey, look how great our organization is!” type of email that we all have come to expect at year-end. Instead, it places the emphasis on someone who has been impacted by your organization, and lets them speak highly of you as a third party. Email Contents: A personal email dedicated to sharing someone else’s story who has been impacted by your organization. Call-to-Action: Ask them to donate now. Sharing someone else’s story, rather than yet another email directly from your organization, helps show that you’re not just tooting your own horn. If you can show this kind of impact, donors are likely to realize just how important their contributions are to the lives of your community. We briefly touched on this type of email in the Giving Tuesday series. So, let’s spend a little bit more time looking at what happens after someone accepts your free offer. Email Contents: A personal email offering something of value to the donor or subscriber like an ebook, a webinar, a course, an infographic, or other content that requires them to complete a form. Instead of being sent to a confirmation page, they’re sent to an instant donation page. The free download gets sent to them in an email, rather than being linked to on the page. And instead of simply saying “Thank You,” the instant donation page briefly thanks the donor before transitioning into how a donation right now can help share this same type of value with more people, or make a deeper impact on your cause. However you frame your donation ask, it must be related back to the eBook (or other free offer) that your donor just accepted. And the donation for must be on this page, not linked to from an additional call-to-action button. If you need help crafting your instant donation page, you can get a free instant donation page template here. 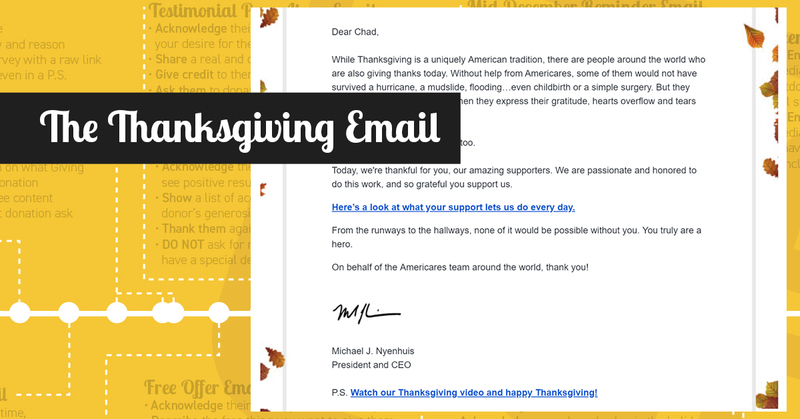 These 5 emails aren’t the end-all-be-all of year-end fundraising emails. Instead, they’re new levers and angles you can use to maintain relevancy as you try to keep your organization in your donor’s mind as year-end approaches. You should still finish off your campaign with an email on December 30th, as well as a morning and evening email on December 31st. That’s because December 31st is the biggest giving day of the entire year, so it’s critical that all your year-end communication culminate in this one final push. And, maybe most importantly, don’t forget to send a thank you to your donors during that first week of January. If you’re not thanking your donors well, they might not think their gift matters nearly as much next time around. If you need more research-driven ideas to test in your year-end fundraising, you can snag the free eBook called Cut Through the Clutter to get ideas based on an analysis of over 6000 year-end emails. You can get your free copy here. 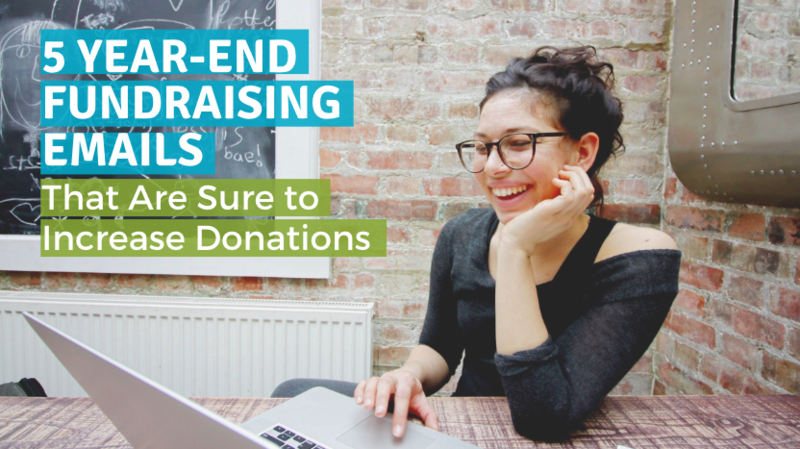 And if you really want to go deep, there’s an in-depth online year-end fundraising course you can take for free as well.